The ClaroRead Chrome Extension sits in your Google Chrome web browser. It lets you speak web pages, PDFs and Google Docs on Windows, Mac, or Chromebook. You must be in Google Chrome! Simply point the mouse pointer at something in the current web page – a link or a paragraph or an image – and ClaroRead will speak it aloud. With the mouse, select some text in the web page. After you release the mouse it will be spoken aloud by ClaroRead. You will see a Play and Stop button appear on a floating toolbar. Tap or click where you want to start reading and tap or click Play and Stop to have the page read out, highlighting as it goes to show you where it is up to. This works in web pages, PDF files, Google Docs and (for Premium users only) Word Online (Office 365) and Google Slides. You can choose the highlight colour in Settings. Premium only. Click on the Scan from screen button and your mouse changes to cross-hairs. Select a region of the screen – like a page of text in a Google Book – and it will be captured, converted into text and spoken aloud. The conversion (OCR) all takes place in your browser. As you type, ClaroRead will echo back each letter, word or sentence. You can also have it speak the letter sound instead of the letter name – so “buh” instead of “bee” for B. (Speaking letter sounds is not available in every language). If you click on the drop-down next to the Scan from Screen button you will see a button for ClaroRead Cloud OCR. This lets you convert documents on your machine, from your camera, or in Google Drive or Dropbox or OneDrive. You can make images into text or make PDF files that do not speak, speak. You need to have a ClaroRead Cloud account to access this feature, but if your school or organisation hasn’t provided this, you can sign up for free. Select the language of the voice you want to use. You get more voices if you are a Premium user. Voices labeled Google or Chrome will work whether on or offline – they are built into your browser. Voices labeled Acapela or Vocalizer will only work online. Other voices may be available on your machine (e.g. Daniel on Mac or Hazel on Windows). See How to get more voices for ClaroRead Chrome. You can change the rate that the voice speaks. When Click and Play is active ClaroRead will add a Play and Stop button to every web page when it loads. Click or tap in the page and that sentence will be highlighted. Select the Play button and the whole page will be read out from that sentence onwards, highlighting as it goes. You can move the Play and Stop buttons if they are in the way by dragging the cross to the right. Turns on or off speaking when you select text with the mouse. Turns on or off speaking when you point at something in the web page. Turns on or off echoing each sentence as you type it. Turns on or off echoing each word as you type it. Turns on or off echoing each letter as you type it. Check to turn on a floating word prediction window that suggests words to complete what you have typed. 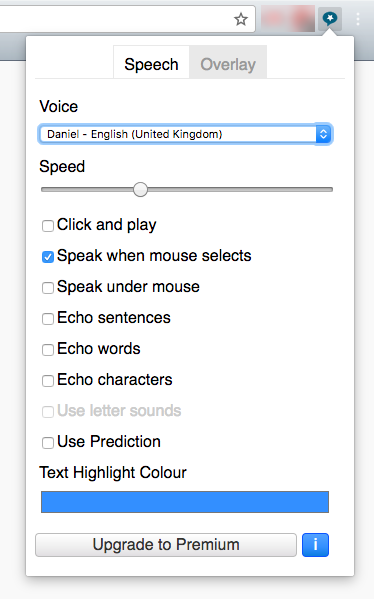 If you have speak under mouse turned on, you can hover over words to hear them read aloud. Click on a word to have it complete what you have started typing. The language of prediction matches the language you have chosen for your text-to-speech voice. 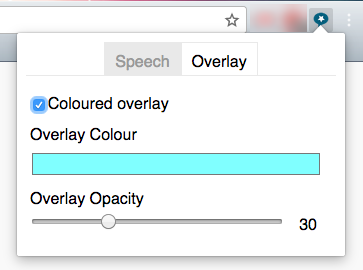 Choose the colour used to highlight the current text being spoken by Click and Play. Many people find a tinted, lower-contrast look easier to read. Check this to turn on tinting, and select the colour and degree of tinting.